Leaders of the OTOC Environmental Sustainability Action Team organized a meeting with Sen. John McCollister (Dt. 20–South Central Omaha) on Friday, June 26th which was held a Countryside Congregational Church. Immigration Action Team Co-Chair Kathleen Grant thanked Sen. McCollister for his critical support for LB 423 which allow young adult dreamers the opportunity to qualify for a driver’s license in Nebraska. Sen. McCollister named the bill his sole priority bill and then worked to get the bill out of the Transportation Committee. Once out, the bill received the support of Unicameral which easily completed and override of Governor Ricketts’ veto of the bill. Mark Hoeger, Co-Chair of the OTOC Medicaid and Taxes Action Team thanked Senator McCollister’s for his ongoing support for Medicaid Redesign in the recent session. 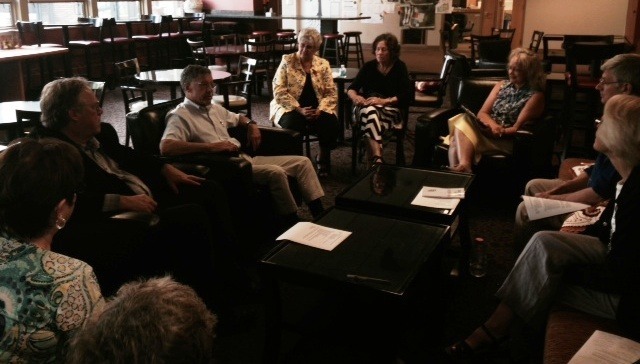 The group discussed OTOC’s ongoing determination to see the State of Nebraska expand the coverage of Medicaid permitted by the Affordable Care Act so the more Nebraska families can afford to purchase health care. OTOC leaders agreed to continue educating congregations members about why this legislation would be a priority for the state. Sarita Penka, Co-Chair of the OTOC Mental Health Action team described the many challenges that people with behavioral health issues face in our state. Sen. McCollister was aware of the recent study which documented major gaps in the behavioral health system in the state. He invited Mrs. Penka and the OTOC leaders present to send him a short white paper about the kinds of changes OTOC would like to see in the existing system. Laurie Gift, Chair of the of OTOC Environmental Sustainability Action Team discussed OTOC’s views about the challenges facing our state as a result of climate change and various bills and initiatives that might help somewhat mitigate the damage caused by the well documented changes to our climate. Sen McCollister is on the Natural Resources Committee and is well aware of the role that man made pollution is playing in climate change. OTOC leaders again indicated their willingness to continue educating the public about the science and the moral imperative of addressing climate change, recently illustrated by Pope Francis’ Encyclical, Laudate Si. Housing Action Team Gloria Austerberry talked with Sen McCollister about OTOC’s ongoing efforts to assure that the City of Omaha has sufficient resources dedicated to assure that property owners in older neighborhoods maintain their properties up to city housing code standards. She also discussed the potential positive impact of the Omaha Land Bank which OTOC supported at both the Unicameral and the City Council.